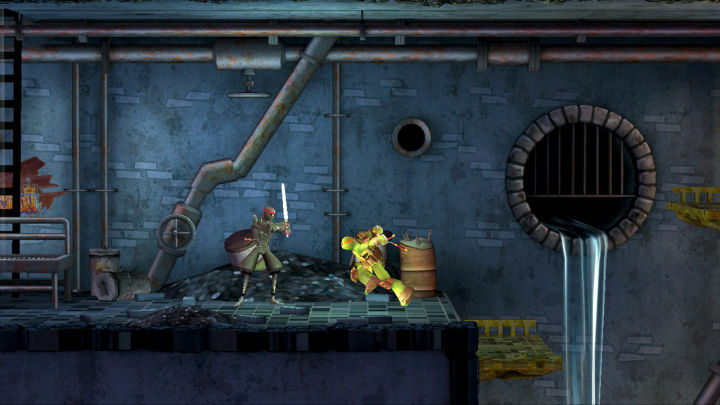 Teenage Mutant Ninja Turtles, the heroes in a half shell have brought more turtle power to the Xbox 360. 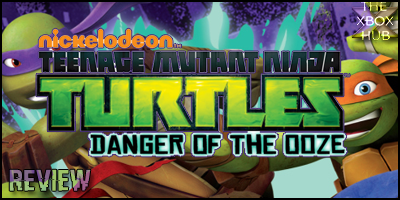 These turtles are returning to console after a few non-favourable outings in the hope that this newest game Teenage Mutant Ninja Turtles: Danger of the Ooze, which is based on the Nickelodeon show, can stand out for all the right reasons. Danger of the Ooze takes place during the gap between season two and three of the TMNT Nickelodeon television show. 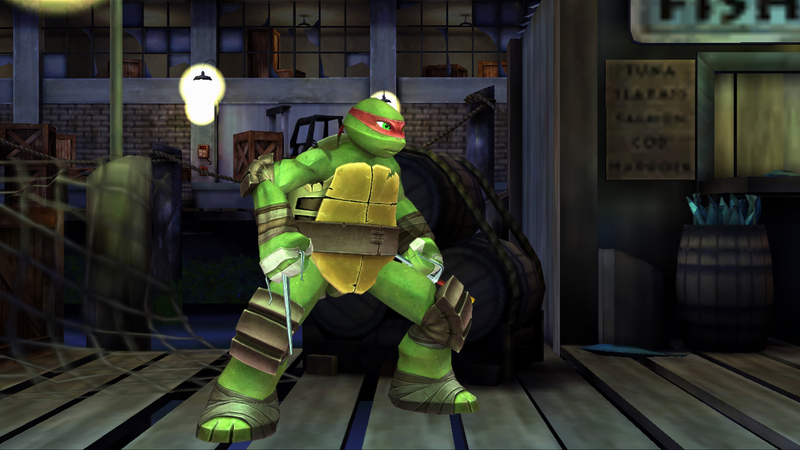 Join Raphael, Donatello, Leonardo and Michelangelo on the hunt for Shredder before he unleashes a new Super Mutagen that can destroy the city the boys call home, New York City. After the last game that had links to the show in 2013 they’ve changed their tact from producing a 3D platform beat-em-up to now offering a side scrolling 2D action brawler. Well my initial reaction to seeing their new style in action was that it was a major step backwards from what was already a pretty poor game that lacked ideas in the form of Teenage Mutant Ninja Turtles (2013). Basically you can move left, right, up or down across the entire game so there’s no movement depth at all. We’ve all played things similar in the past though so all is not lost, yet. All of the turtles are usable after the really basic tutorial by Splinter, sadly only one can be used at a time but you can change “on the fly” between them to use your favourites. Anyway it all begins in the turtle’s lair where you then move onwards and upwards around the entire city from the streets to the TCRI building and even the docks. None of the areas stand out for their looks, in fact if you told someone to think of a generic sewer or a generic building block then you’ll get what they have here. Obviously there are enemies causing obstruction to prevent a safe passage and as a Ninja Turtle it shouldn’t be an issue taking down a Kraang Droid, right? Wrong. Even if there’s just a single enemy standing around, if you get too close you’ll lose health regardless of them attacking or not. This gets rather annoying especially when trying to judge the reach of your turtle of choice or jumping to a ledge where one is positioned directly in the way. It doesn’t help that the combat is ridiculously basic with just the four different combos all related to one button. Sure there are other ways to harm foes such as using a limited number of shuriken stars to throw but this isn’t enough. There are also special weapons like smoke bombs that help you traverse the often puzzling areas. Which brings me to my next point, getting around the non-linear world, all in one go! In one go? Yes, that’s the idea they have attempted here with eight chapters, each of which you’ll likely visit more than once. If all your turtles die in chapter 3 for example, you’ll be plonked right back at the very beginning, albeit with the skills you’ve found. Despite there being numerous areas to manually save, a death is a fatal blow to the enjoyment when it’s so easy to lose all health and you have to go through the same monotonous places, over and over again. It doesn’t matter how many little branched out areas to collect upgrades there are, they just aren’t of any interest to someone who has just wasted hours slogging through annoying enemies. There were high hopes when I saw the opening cut-scene that maybe, just maybe they’d moved forwards on the overall look and feel. Unfortunately it all seemed to go downhill from this point thanks to numerous aspects of the game. At least it stayed true to the TV show by bringing in allies Casey and Slash even if only for a short dialogue. Baxter Stockman is just one of the bosses you’ll face but you’ll be secretly hoping he was the only one after yet another bore-fest encounter. You may think this comes across as an overly negative analysis but the entirety of it is completely warranted. Considering the target audience is mainly the youngsters, I fear it’s entirely too complicated to navigate back and forth with such a terrible map being the only guidance. Add to this the annoying difficulty which cannot be altered and the unforgiving death penalty; if it can frustrate the hell out of me in no time then the patience of a child will wear thin all too quickly. I’m struggling to find any positives for what I can confidently say is on par with the worst TMNT themed game I’ve ever played and believe me when I say I’ve pretty much played them all. I’d usually expect at least a fun, wacky experience from the turtle dudes no matter what the platform, be it video game or TV but it’s missed the mark completely here and although my eyes see those fun loving heroes, in reality it doesn’t feel anything like it should. Give it a wide berth, save your money for another game… any other game.